The much awaited 2012 World Chess Olympiad, its 40th edition, had began yesterday, the 28th of August at the Istanbul Expo Center with the games of the first round. As reported earlier, a record breaking of 158 teams compete in the Open/Men Section, while the Women Section has 124 teams. The events are run by Swiss pairing system, wherein the top seeded teams faced the lower rated teams, one of the many reasons why most of the world’s best players participating in the Olympiad especially those assigned on board-1, sat out in the first round. All of the favored and higher rated teams won over their respective much lower rated opponents with some upsets on the individual boards. Except for some mistakes in the ‘live transmission’, wherein the organizers of the 40th Olympiad had recognized and expressed their apology and had promised to do their best not to commit same mistakes in the remainder of this great event, Round-1, overall, was a success. Round 2 starts at 15.00 (3:00PM) Istanbul time or 8:00PM Manila time the 29th of August. Another day … another CHALLENGE for TEAM PHILIPPINES ! One thing about the OLYMPIADS and the SWISS SYSTEM … as the TEAM wins/scores … next time around the team will be pitted against a team with the same score and as the team progresses expect STRONGER TEAMS to play against !!! Team Philippines (Men/Open) #35 seed will be facing the much higher #23 seed Moldova who also won their Round-1 against Pakistan with a score of 3.5-0.5. Moldova Board-1 player is Hyper GM Viktor Bologan with a FIDE rating of 2734. 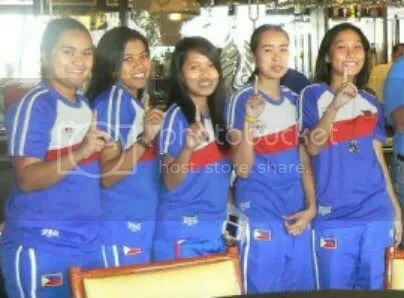 Team Philippines (Women) seeded #57 will be facing a tough opponent, #16 seed Slovenia. 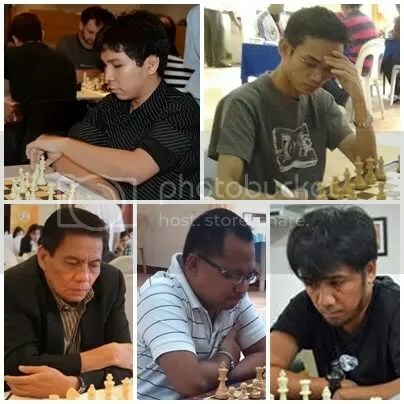 It’s an UPSET win for Team Philippines (Open) Vs Moldova : 2½-1½ in round-2 when IM Dimakiling draw the first blood winning his game at board-4 against IM Baltag, Iulian in 37 moves. GM Barbosa settled for draw at board-2 against GM Svetushkin, Dmitry and GM Paragua followed suit later drawing his game at board-3. 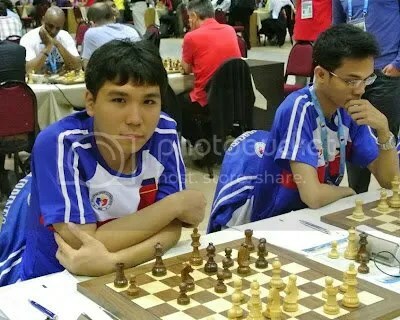 The deciding game at board-1 between GM Wesley So and Hyper GM Viktor Bologan (2734) also ended in a 74 mover draw. Wesley’s coach at Webster University GM Susan Polgar later tweeted that Wesley missed a win in move 32 and again in move 33. Of course at that time, Wesley was already in time pressure with less than two minutes in his clock to complete his 40 moves. As a consolation, GM Wesley So, continued his “No-Loss Record Vs GMs with 2700+ rating“, now a total of 33 games. 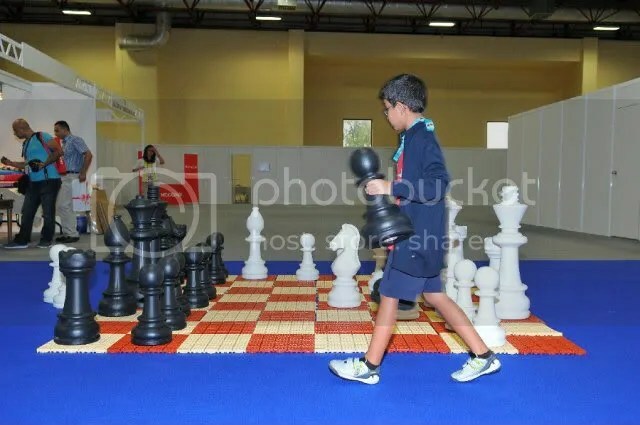 I’ve wrote about this last August 5, 2012, ’No-Loss‘, meaning, he had not incurred a single game loss against any of the Hyper-GMs when they were officially @ 2700+ FIDE rating at the time he played them. Lady Luck was against Team Philippines (Women) this time when they lost to the #16th seeded Slovenia by a narrowest margin of 2½-1½. WIM Perena at Brd-1 had to contend with the top rated competitor in the Women’s Olympiad & ranked World’s #2 Woman chessplayer (as of Aug 2012 FIDE rating), Super GM Anna Muzychuk (2606) of Slovenia, and resigned after the 55th move. 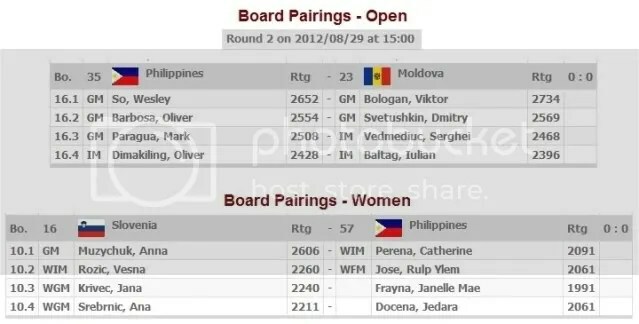 WFM Rulp Ylem Jose also lost her game in Brd-2 while Philippines Brd-4 Jedara Docena had drawn her game. The only winner in round-2 for Team Philippines (Women) was Brd-3 player Janelle Mae Frayna. 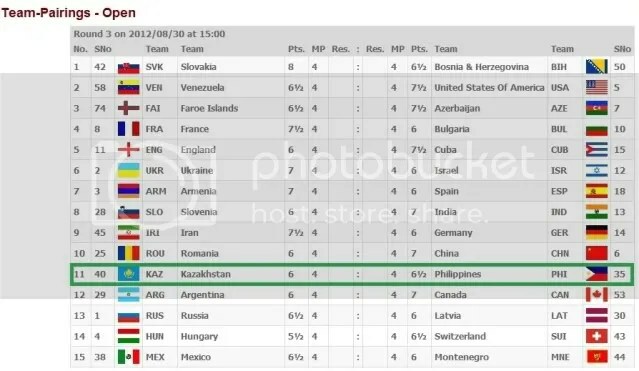 As a preview for Round 3, Team Philippines will take somehow a breather for both teams as the Men’s Team will battle with #40 seeded Kazakhstan while the Women’s Team will square off with #58 seeded Turkmenistan.